New 2018 Meyer RTX226-HC-Trail (replaces 6200 series) 26-foot front and rear unload forage box with independent outfeed clutch, heavy duty bevel RT geardrive variable speed system, feather start augers, all steel subframe and floor support, high sides, 667X main apron chains, 24" fold-down cross conveyor extension, left side unload, solid high molecular poly floor, 4th beater, rear gate delay, LED transport lighting with hookup cord, tie down kit, less roof, hydraulic front and rear unload, Meyer XT2200XL tandem trailer (22 ton capacity), 3½" spindles, heavy duty clevis hitch, jack stand, 10-bolt wheel and hubs with four used 425X65X22.5 truck tires. Ready to go. Lists @ $51,650, plus freight & setup. New 2018 Meyer RTX224-HC-Trail (replaces 6200 series) 24-foot front and rear unload forage box with independent outfeed clutch, heavy duty bevel RT geardrive variable speed system, feather start augers, all steel subframe and floor support, high sides, 667X main apron chains, 24" fold-down cross conveyor extension, left side unload, solid high molecular poly floor, 4th beater, rear gate delay, LED transport lighting with hookup cord, tie down kit, less roof, hydraulic front and rear unload, Meyer XT2200XL tandem trailer (22 ton capacity), 3½" spindles, heavy duty clevis hitch, jack stand, 10-bolt wheel and hubs with four used 425X65X22.5 truck tires. Ready to go. Lists @ $49,150. New 2018 Meyer 8126-H-RT 26-foot rear unload forage box, dual hydraulic apron chain drive motors, 14" extension sides with screen kit, gate delay, transport light kit, 2200XL series tandem trailer with set of four 425/65/R22.5 tubeless tires mounted on new 22.5X13 heavy duty rims. Trailer S.N. : 1822XT257. Lists @ $45,230. New New Holland FP230 forage harvester with Metalert III, walking tandem axle, 1¾" PTO (can convert to 1⅜" PTO), electronic controls, crop processor, transport lights, hydraulic swing tongue. New 2019 New Holland Roll-Belt 460 Silage Special round baler, 4' wide by up to 6' diameter bale size, endless belts, net & twine (deluxe or ISO), 540 PTO with cutout clutch, 18LX16.1 10-ply tires, HD density system, bale ramp, five-bar 1.8M pickup with 4.80/4.0-8 no-tools dual wheels, hydraulic pickup lift kit, 1.8M roller windguard. New 2016 New Holland 460 round baler, 4' wide by up to 6' diameter bale size, silage special, 5-bar 1.8m pickup, tine windguard, endless belt, ISOBUS with monitor, net and twine (deluxe on ISOBAR), 540 PTO drive, 18LX16.1 10-ply tires, in-cab density system, rear bale ramp, 4.80 no-tool adjustment of dual pickup wheels, hydraulic pickup lift kit. 2015 New Holland Roll-Belt 450 round baler, 4' wide by up to 5' diameter bale size, laced belts, ISOBUS with monitor, 540 PTO, 31X13.50X15 8-ply tires, net and twine wrap, bale ramp, 1.8 m 4-bar pickup with roller windguard, no-tool adjustable dual pickup wheels. New 2017 Meyer 4518-RT forage box, 18.5-foot load space, left hand front unload, fold-down discharge extension with lift assist, high range/low range variable speed apron, variable speed feathering control on three large augers, independent outfeed clutch, heavy duty RT160 auger gearbox, heavy duty main and cross conveyer apron chain, LED lights with hookup cord, standard equipment quick detach roof, X1506 15 ton tandem axle wagon gear with 125LX15 12-ply tires with heavy duty tubes mounted on 15" X 10" 8-bolt rims (wagon gear S.N. : 1517231), extension tongue with spring lift assist. One only. Lists @ $27,230, with freight and setup. New 2018 New Holland 560 Specialty Crop Rollbelt "Texas Long Horn Special" round baler, produces 5' wide by up to 6' in diameter bales, 1,000 PTO with cut-out clutch, 21.5LX16.1 10-ply tires, pair of 15X6.00-6 castering pickup wheels, bale ramp, clevis-style hitch, 2.07m five-bar pickup with roller windguard, hydraulic pickup lift kit, premium heavy duty laced belts, net wrap and twine wrap (deluxe or ISO), standard tailgate, in-cab density control system. New New Holland BC5070 small square baler, hydraulic swing tongue, hydraformatic bale tension, flotation tires, clevis hitch, twine tie. Ready for bale chute or bale thrower. New New Holland DB316R 16' discbine mower conditioner, rubber chevron rolls, 1⅜" 1,000 PTO, 2 pt. swivel hitch. Replaces New Holland model H7460. Also available with swivel drawbar hitch. New New Holland DB313R 13' discbine mower conditioner, rubber chevron rolls, 1 3/8" 1,000 PTO. 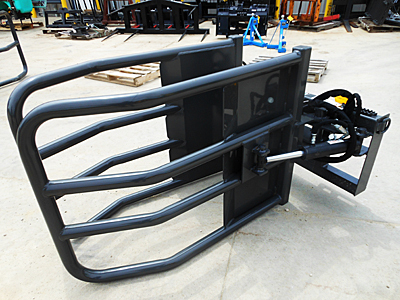 Available in either a swivel drawbar hitch or swivel two-point hitch. Replaces models 1431 and H7450. New New Holland DB312R center pivot. hydraulic swing tongue discbine, 2 pt. 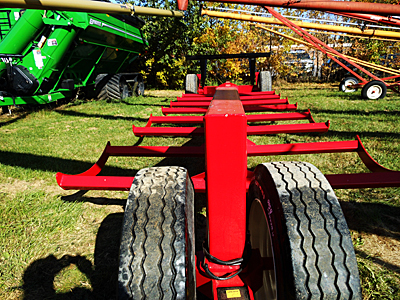 swivel hitch, 11'6" cut, nine-disc cutter bar with Shock Pro hubs and quick-change knives, mechanical header tilt, 115" long Chevron conditioner rolls, transport lights, 1⅜" 21-spline 1,000 PTO, two 300/55-17 floatation tires, 1" to 4" cutting height. Requires minimum 87 PTO hp. New model for 2018. New 2016 New Holland H7230 MowMax discbine, 10'4" cut, rubber conditioner rolls, drawbar swivel hitch, 540 PTO. New New Holland H7230 MowMax discbine, 10'4" cut, rubber conditioner rolls, standard drawbar hitch, 1,000 PTO. New 2016 New Holland H7220 MowMax discbine with 9'2" cut, seven-disc cutter bar with hydraulic header tilt, 540 PTO, standard drawbar hitch, rubber conditioner rolls. New 2017 New Holland H5420 windrow merger/inverter, 9' pickup width, tractor-driven hydraulics, requires two remote valves -- 1 remote with 16 gpm flow @ 2,000 psi and 1 remote for pickup lift & lower and tongue shift -- with tractor-mounted electrical control panel, safety tow chain, brake/flasher/turn signal light kit, new tires. Has optional windrow inverter attachment and 2' conveyor extension. New New Holland DuraDisc 108M disc mower with MowMax cutter bar, 7'10" cutting width, Cat II 3 pt. hitch, 6 cutting discs with two reversible quick change knives per disc. Minimum 55 PTO horsepower required. The DuraDisc 108M replaces the H6740 disc mower. New New Holland HM235 disc mower, 6'8" cutting width, Cat I and II 3 pt. hitch, 5 cutting discs with two reversible knives per disc. Minimum 40 PTO horsepower required. New Enorossi BHT-25V 24-foot tedder, hydraulic fold, hydraulic tilt, U-joint rotor style, total six rotors, 36 arms with six tines per rotor = 36 tines total, four 16X650-8 tires and four 18X850-8 tires = total of eight wheels and tires, 540 PTO with clutch. Requires a minimum of 35 hp. Lists @ $11,375, plus freight and setup. New 2017 New Holland Duravee 1020 10-wheel rake, single side opening, 20-foot maximum working width, tongue jack, safety tow chain. New 2019 New Holland Procart 1225 12-wheel V rake. Pictured with optional center kicker wheel kit. New 2019 New Holland 819 Procart 8-wheel V rake, one arm per each rake wheel, optional center kicker wheel kit. New Holland 3114 ProRotor rotary hay rake, 13'9" working width, 540 PTO, tandem axle, hydraulic lift with cylinder and hose. Rake equipped with optional tine-saver clips. New 2018 Notch 10BT-30K 10-bale round bale transport with 2BT cradle (increases transport capacity from 10 bales to 12 bales), used 255/70R22.5 front tires, used 385/65R22.5 rear tires, rear transport light package. Red color. Maximum capacity 30,000 lbs. New Enorossi G4V 570 PTH (BHT-19V) 19-foot hay tedder, hydraulic folding wings, hydraulic tilt, U-joint rotor drive style, 540 PTO, set of four 16X650-8 wheels and tires, four rotors with 24 tine arms with six tines per rotor. Weighs 1,323 lbs. Includes all cylinders and hoses. Setup and ready to go. Lists @ $7,895, plus freight and setup. New 2017 Notch 10BT 10-bale round bale transport with 2BT cradle (increases transport capacity from 10 bales to 12 bales), used 23580-22.5 front tires, used 385X22.5 rear tires, rear transport light package. Red color. Maximum capacity 22,000 lbs. 2019 New Holland Procart 1022 10-wheel deluxe carted wheel rake with individual floating wheels. Shown with optional center kicker wheel kit. 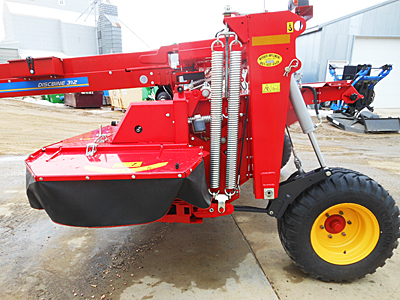 New 2018 Enorossi G4V 520 PTH 17-foot hay tedder, hydraulic folding wings, mechanical hand crank rotor tilt, 540 PTO with slip clutch, set of four 16X6.50-8 wheels and tires, four rotors with 24 tine arms and six tines per rotor. Weighs 1,146 lbs. Includes cylinders, hoses and male hydraulic ends. Setup and ready to go. Lists @ $6,535, plus freight and setup. 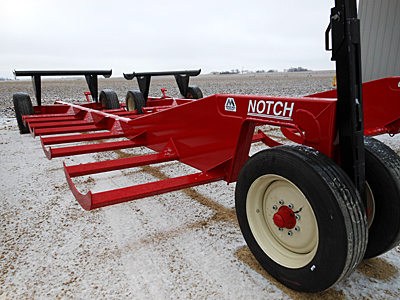 New Notch 8BT-19K round bale transport with 2 bale cradle (10-bale capacity), 8" X 16" front wheels with used heavy duty pickup tires, used 10-22.5 rear tires. Red color. New Econo-Wrap model EW-450S 3 pt. single-bale wrapper, maximum bale size 4' X 5' and 2,100 lb. maximum bale weight, requires minimum 40 hp. Includes bale counter. Approximate wrap time is 90 seconds. Comes complete. Simple to operate. Weighs 1,091 lbs. Also available in pull-type model, EW-1200T. New JBM (John BM Mfg.) 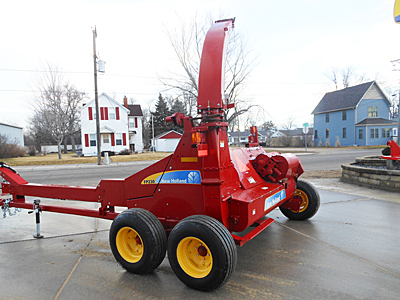 Mighty Bale Handler 141943 round bale transport, four used 245RX16 10-ply tires with tubes, 6-bolt wheels on front steer axles, 8-bolt rims on rear axles, telescopic tongue, SMV sign, 8 bale capacity, or 16,000 lbs. Red color. New Enorossi G2LP 10-foot twin-rotor tedder, 10-foot working width, 540 PTO drive with slip clutch, 15.6X6 tires, mechanical rotor tilt. New; setup and freight included. 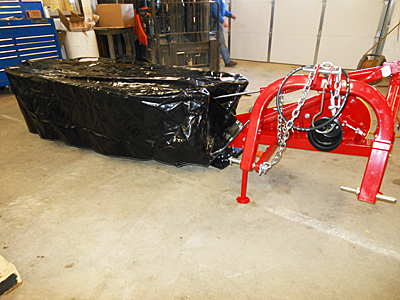 New CID XBS X-treme bale squeezer, twin 2½" X 8" cylinders with hoses and flat face couplers, 2,800 lb. holding capacity, for 4', 5' & 6' bales. Weighs 661 lbs. 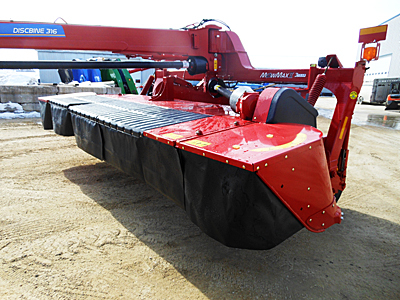 New CID HDBS heavy duty bale squeezer, single cylinder with hoses and flat face couplers. Tubular design allows wrapped bales to be transported without tearing the plastic film. Pick up bales sitting flat or on their side. 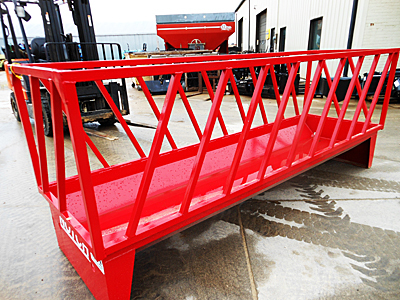 New Notch SF712 7' X 12' slant bar feeder with 26 openings and optional hinged gate on one end. Green color. 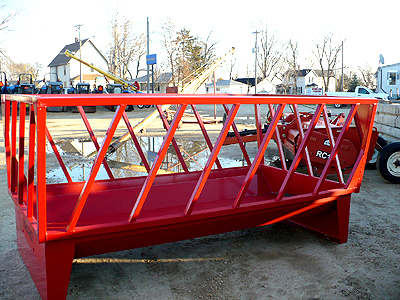 New Notch SF712 7' X 12' slant bar feeder with 26 openings. 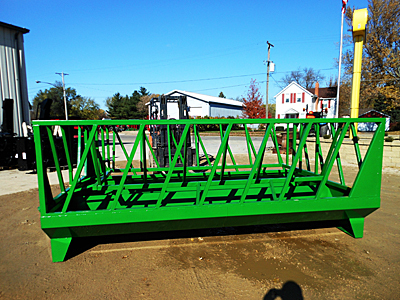 2013 Notch FBF10 flared bunk feeder with 22 openings. 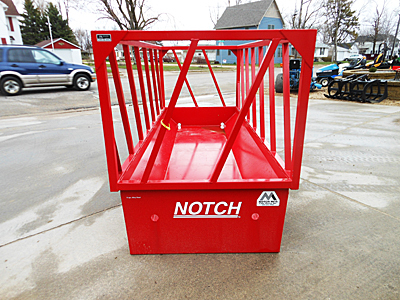 Notch BF10 4' X 10' bunk feeder, 10 gauge steel, 1½" square tube slant bars, 2" square tube frame, 20 openings. Red color.